Bernie Shaw was born on june 15 1956 in Victoria the capital of British Columbia, Canada. At the beginning of 1970 Bernie dreamed of becoming a rock guitarist. He bought himself a Gibson SG Special and started practising. When the local band COLD SWEAT was looking for a second guitarist in 1974 Bernie auditioned but the bassplayer asked him if he knew what he was playing. He told him to do himself a favor by buying vocal gear set and come back the next week. Shaw followed up this advice, and when he auditioned as a singer the band was convinced: This was their new vocalist. The interest in rockmusic was changing and COLD SWEAT changed their name in Buckshot. With this name they tourt for some months. In the summer of 1977 the band quitted due to lack of succes. Shaw: I had enough of doing all these small clubs. I wanted to go further then that. His next band was Legend. This formation came from Saskatoon. Shaw played 9 months with them before a flew back to Victoria. Also in this year Shaw played with Phil Lanzon ( Ex Romance) in PARIS. In December 1978 Paris signed a record deal with RCA and changed their name to GRAND PRIX . Its here that Shaw sang on his first album: GRAND PRIX which was released in 1980. When Shaw returned from the wedding of his sister Oktober 1981 he found out he was replaced by Robin Mc Auley. In december 1981 Shaw joined the 1978 started band PRAYING MANTIS. There he met Tino Troy  guitar Chriss Troy  bass, Dave Potts - drums and John Bavin  Keyboards. The band was managed by Deep Purple founder John Coletta. Still they had problems to get a recorddeal. For a long time they were the most over rehearshed band in London. With Praying Mantis Shaw did not record a album, just the EP "Tell me the nightmares wrong" recorded in 1982. Praying Mantis with Shaw was just live to be seen, like the READING FESTIVAL. In 1993 a bootleg was going around called "live + singles" wich contains 6 songs performed at the Reading festival, followed by pieces of THE SOUNDHOUSE TAPES"  MAXI , the PRAYING MANTIS record, AND THE SINGLES "CHEATED DOUBLE"and "TURN THE TABLES" From December 1983 to the middle of 1984 Shaw played in the by ex IRON MAIDEN drummer founded CLIVE BURRS ESCAPE . Who went on as ESCAPE shortley after Shaws entree. In this band also played Praying Mantis members Chris and Tino Troy. July 1984 again the band choose to go on with a new name. Thats how STRATUS started. The album TROWING SHAPESwas recorded at the FRANKFURTER DREAMBOAT studio with Tino troy guitar, Alan Nelson keyboards, Chris Troy bass, and Clive Burr drums. It was released in the summer of 1984. Like PRAYING MANTIS, STRATUS played melodic hardrock. The 12 pieces of rock sound like a progression of the Praying Mantis music, and therefore interesting stuff for Heepfans. In 1993 the cd version REBORN CLASSICS was released. As a bonustrack on this bootleg the SOUNDHOUSE TAPES are added. Stratus also had one song as a movie soundtrack. The song "RUN FOR YOUR LIFE is used in CLASS OF NUKE EM HIGH (1986/USA) When Stratus gigged at the London Marquee Club one of the visitors was Mick Box. He was looking for a singer who could reach the high notes. 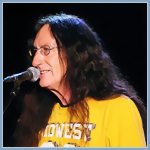 Uriah Heep singer Steff Fontain was just fired. Mick asked Bernie to do a audition for Heep. 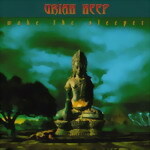 Bernie did and after a heavy night Mick was concluding Uriah Heep got their new frontman.